Washington’s diverse climate and geography. When it comes to climate and geography, Washington State is a study in contrasts. While there is a somewhat common perception that it rains all the time in Washington, Seattle actually ranks 44th among major U.S. cities, getting less rainfall annually than Boston, New York, Houston and Miami. The state’s geography is diverse and spectacular at almost every turn. Washington has seven distinct physiographic regions, from the rugged Pacific coastline and soaring volcanic peaks of the Cascades to the fertile fields of the Columbia Basin. While it’s tempting to delve deep into the geology that created such a diverse landscape over thousands of years, we’ll focus on the two distinct sides of the state since the geology not only drives the geography, but also the climate. The Cascade Mountain Range divides the state Washington into two parts – Western Washington and Eastern Washington. Western Washington is the most densely populated; approximately 60% of the state’s population lives west of the mountains. Seattle, Tacoma, Olympia, Vancouver and Bellingham are all located on the west side of the state. As the glaciers retreated during the last ice age, they carved their memories into the land. Western Washington is hilly and even mountainous in places with lots of rivers and lakes. This includes the three lakes that dictate the geography of the greater Seattle metropolitan area: Lakes Union, Washington and Sammamish. This same glacial activity also created the many islands that dot the Strait of Juan de Fuca and Puget Sound. The result is a landscape that is ever changing and often breathtaking. The weather is relatively mild in Western Washington. Summer days rarely rise above 79° (26° C) and winter days are seldom below 45° (8° C) during the day. Snow is rare, but winter temperatures can easily dip into the 20s and 30s (-6° to -1° C) at night. 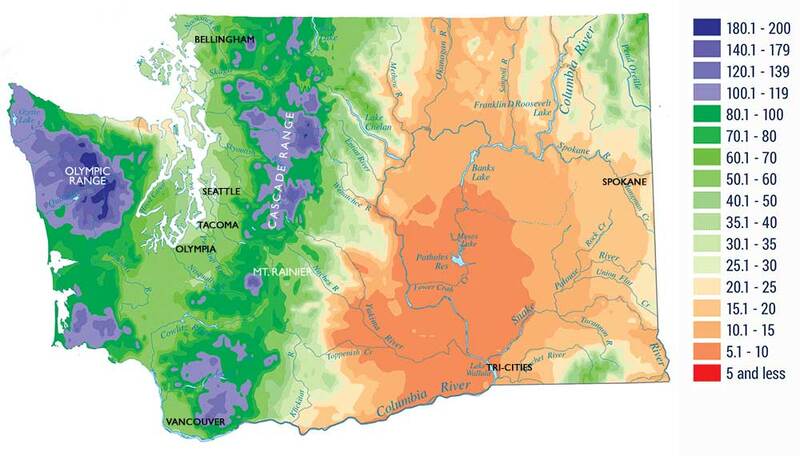 Annual rainfall in the greater Seattle area is about 37 inches (94 cm). The Pacific Ocean creates a marine layer where clouds are frequent in the winter, spring and fall, but a day that is filled with rain is the exception rather than the rule. July and August are the driest months in Western Washington; January and February the wettest. Few homes have air-conditioning. From most vantage points in the greater Seattle area, you can readily see evidence of the geologic upheaval that forged Washington’s magnificent features over thousands of years. The region is surrounded on all sides by mountains: the Olympics to the west, Cascades to the east, Mt. Baker to the north and majestic Mt. Rainier, the tallest peak in the state, commands the view to the south. Just as the Pacific Ocean and Olympic Mountains influence Western Washington, the Cascade Range affects the weather and climate in the eastern part of the state. The Cascades capture most of the rain that would otherwise fall in Eastern Washington. The mountains can get up to 200 inches (508 cm) of snowfall a year, creating a paradise for winter sports enthusiasts. In the shadow of the Cascades, little rain falls and cities like Wenatchee, Chelan and the Tri-Cities enjoy up to 300 days of sunshine a year. Annual rainfall is far less than in Western Washington. In the center part of the state, the climate is a blend of coastal and continental weather and rainfall is approximately 7 to 9 inches (18 to 23 cm) annually. In Spokane, which marks the eastern edge of the state, rainfall averages 15 to 30 inches (38 to 76 cm) a year. Summers are much hotter and winters are much colder compared to the western half of the state. The average summer highs are in the upper 80s to mid 90s (27° to 34° C) and in winter, average daytime temperatures can range from the upper 30s to just above 0° F (3° to -17° C). In terms of geography, Central Washington is almost plains-like, giving way to rolling hills as you travel east. The rich volcanic soil and dry weather creates an ecosystem that is ideal for agriculture and food manufacturing – more than 300 crops are grown in Eastern Washington. The Columbia Gorge, with its spectacularly eroded walls that rise up 3,000 feet (76.2 m) from the Columbia River, adds to the natural beauty of this part of the state. The river’s hydroelectric dams provide renewable, low-cost energy to businesses throughout Washington. You won’t see Washington on The Weather Channel much. Thanks to the marine air and diverse geography, the state rarely experiences severe weather patterns like the damaging hurricanes or tornadoes Jim Cantore covers. Blizzards and major windstorms are rare enough that residents give them names, such as Snowmageddon 2019, the Columbus Day Storm (1962) or the Thanksgiving Day Storm of 1983. The same is true for large-scale flooding. During the rainy season or when the snow melts rapidly in the mountains, you’ll see some localized flooding along the state’s rivers. But the hilly topography of the state makes widespread flooding (as you may have seen in Florida, Texas and Lousiana downtowns) a rarity. The only true force of nature the state deals with is an occasional earthquake. Most are minor and newer buildings and homes (i.e., those constructed after 1970 or so) are built to ride them out with little to no damage. The last “major” earthquake was in 2001, before that, 1965 and 1949.